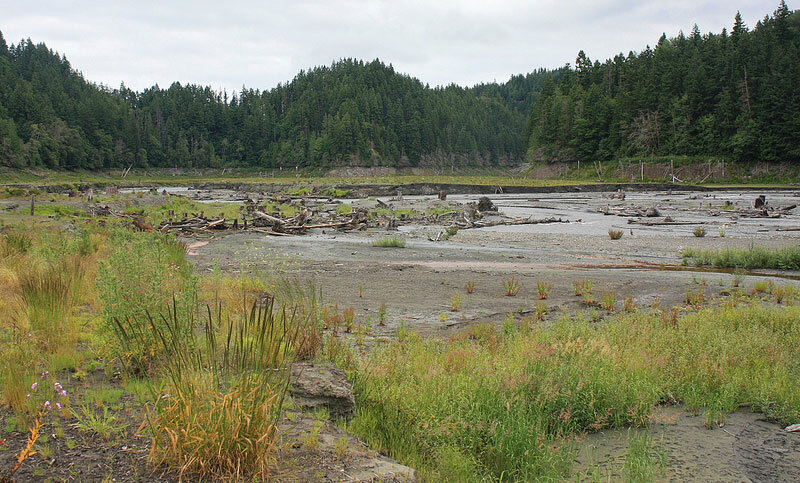 The Elwha River is flowing free, but the restoration project is ongoing. As of this writing, repairs continue at the Elwha Water Facilities Project, clogged with sediment since April. Deconstruction of the Glines Canyon Dam is delayed until the Water Facilities Project is repaired, to prevent the river from transporting the huge amount of sediment trapped behind the remaining portion of that dam. Current updates are posted on the National Park Service Dam Removal Blog. The updates below were posted on August 6, 2013. Also, check out the Elwha River Restoration on Facebook. The river continues to erode sediment downstream, even during the low flow of the dry summer months. In some locations the river has eroded the sediment down to the original riverbed. A sediment team is conducting monthly aerial surveys of the Elwha River to monitor erosion and re-deposition of the sediment. In March, Elwha re-vegetation crews sowed 1,400 pounds of native plant seeds in the lakebeds of former Lake Aldwell and Lake Mills. Crews surveyed the sites planted in 2012 with native species and found a 97% survival rate for 6 species studied. The highest mortality rate was 36% for Douglas fir seedlings; the lowest mortality rate was 1% for black cottonwood. In August, crews are planting 41 additional plots in the lake beds and collecting data on ground cover and species abundance. Vegetation grows on the lakebed of former Lake Aldwell. Re-vegetation crews have planted native seeds on the former reservoirs. The Washington Department of Fish and Wildlife is installing a fish weir on the river downstream of the former Elwha Dam site. The state will use the weir to count and collect fish as part of a multi-agency effort to monitor the influence of dam removal on salmon and steelhead returns to the river, and to minimize harm during the dam removal to the federally-listed, threatened steelhead and Chinook. The plume of sediment coming out of the mouth of the Elwha continues to change and shape the beach. The sediment is forming sandbars and large pools where none were before. A 2012 National Park Service Elwha River Restoration handout reads: The returning salmon and restored river will renew the culture of the Lower Elwha Klallam Tribe who have lived along the river since time immemorial. Tribal members will have access to sacred sites now inundated by the reservoirs. Cultural traditions can be reborn. The last stop on my Environmental Health Field Trip was at the Lower Elwha Gallery & Gift Shop in Port Angeles where I bought a children's board book, Sharing Our World, Animals of the Native Northwest Coast. One page reads, "Salmon have always been our most important food source. We can protect salmon by keeping our rivers and oceans clean." The river will never be the same as before the dams, but the habitat is improving and the fish are coming back. The Elwha is on its way to becoming what dam-builder Thomas Aldwell described over 100 years ago, "a wild stream crashing down to the Strait". Thank you for reading. Here are some resources to help you take your own environmental health field trip to the Elwha River.